The Summer Games have come to an end but you can still keep the excitement of London 2012 alive with these Olympic Torch cupcakes. 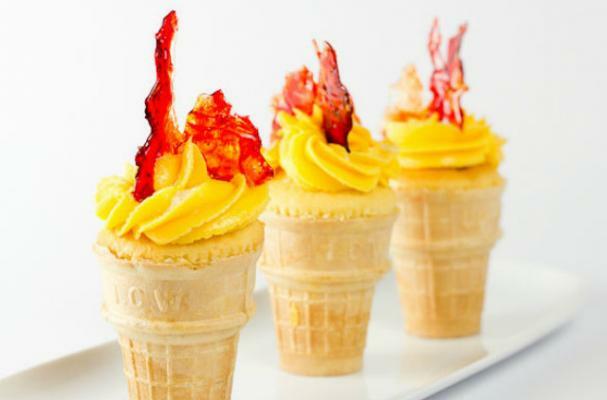 Created by Vicky over at Stasty, the cupcakes are lemon flavored and baked into an ice cream cone. "The cupcake is topped with lemon butter icing and adorned with red and orange shards of caramelized sugar," Vicky said. "The tangy lemon is a great match for the hard sweet caramel and crispy cone." To get all the details on how to make these Olympic Torch cupcakes, click here.